The Samsung Galaxy tablet is a gizmo with many purposes. Its capabilities are limited only by the apps you get for it. To help you grasp this concept, the tablet comes with a slate of apps preinstalled. They can give you an idea of what the tablet is capable of, or you can simply use those apps to make the Galaxy tablet a more versatile and useful device. The Calculator is perhaps the oldest of all computer programs. Even most stupid cellphones back in the 1990s had calculator programs. Start the Calculator app by choosing its icon from the Apps screen. The Calculator appears. When used in a vertical orientation, the app loses the scary math buttons. Type your equations using the various buttons on the screen. The parentheses button can help you determine which part of a long equation gets calculated first. Use the C button to clear input. Long-press the calculator’s text (or results) to cut or copy the results. One way to use the Calculator frequently is to determine your tip at a restaurant. A calculation is being made for an 18 percent tip on an $89.56 tab. 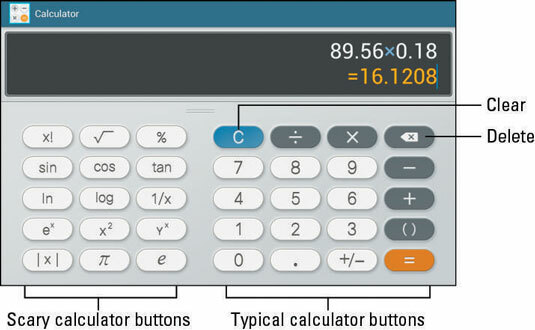 If your tablet doesn’t have a Calculator app, you can obtain one from the Play Store.